You know that moment in time when you feel like things are flowing along, and there’s good stuff on the horizon? I always get a little uneasy in those moments, and glance over my shoulder for the rogue wave that’s probably headed straight for me. That’s just my reality. First, let me say we are tremendously thankful that no one was hurt in what could have been a terrible tragedy. As I’ve heard and said many times the past few days, things can be replaced. 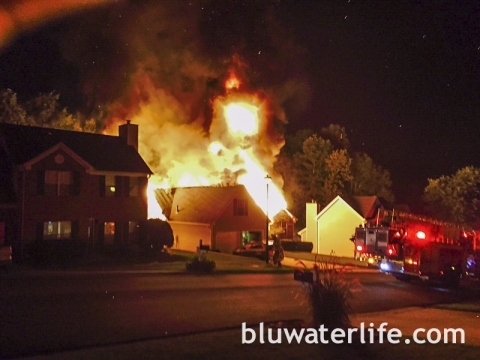 A fire started in the middle of the night at Bluwaterguy’s neighbor’s house, and VERY quickly engulfed their house. A complete and heartbreaking loss for them. I cry every time I look over at the charred mess that was their home. The fire responders arrived in minutes to try to contain the fire. 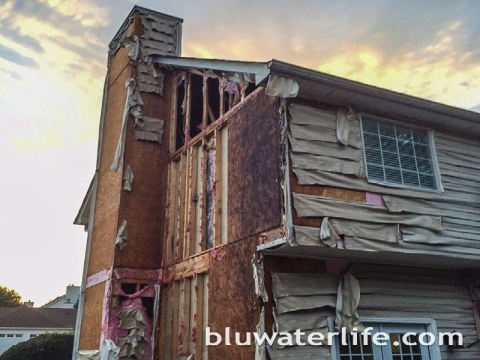 They had to soak Bluwaterguy’s house to save it from the intense heat, flames, and smoke. Roughly a third of his house will have to be rebuilt ~ but at least he has something to rebuild. It could have been so much worse, and again we are so thankful everyone escaped safely. A couple of days dealing with disaster mitigation teams and adjusters. Packing up, hauling off and starting to dry out. 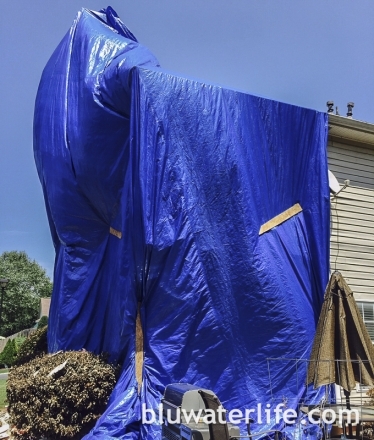 Oh, and now a blue tarp the size of a Ringling Brothers circus tent over one end of the house. For once it makes sense to have two homes, as we can transition back and forth from his house to my condo. We’ll start working on the reconstruction shortly, and continue to count our blessings. Things may be a little quieter than usual on the blog and on my social media pages while we sort this out. Life takes priority! I’m happy that the bluwaterlife site update will continue and am hoping that debuting a new, fresh look here in a few weeks will re-energize my blogging mojo. It’s funny that I had just posted the photos from the bonus room reno, craft room tour, and furniture refresh. Though that room is on the other end of the house and was not damaged, it is serving as a holding space for displaced furniture and decor from other rooms now, so in other words, it’s a mess. But another thankful sigh as my craft space is intact. I feel guilty even saying I’m thankful to have my craft space intact, when I see this scary shot from the night of the fire. This is the neighbor’s house exploding in a fireball. You can see the chimney end of Bluwaterguy’s house on the left. Wow, it could have been so much worse! His neighborhood is generously sharing with the neighbors who lost their home. There but the grace of God go any of us! So, this is why I always look over my shoulder. I’ve experienced my share of rogue waves in the past years. Though in the end, those moments help you know what’s really important. Support from friends and family has been great the past several days. We’ll be focusing on the important stuff for the next piece of time. Still about “life enjoyed”, just with an extra splash of gratitude for the “life” part these days. Love and thanks to you all! 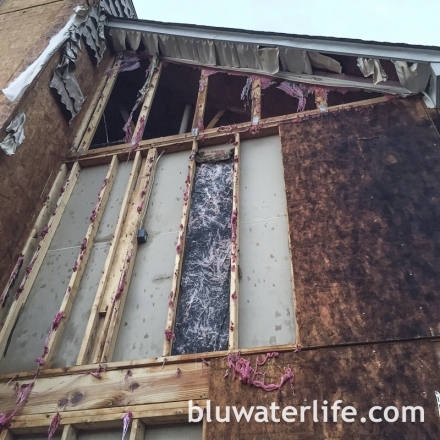 Bobbi and Brad – so glad that you are both okay and that your home was saved. It really does put life into perspective as to what is – and what isn’t – important! Hang in there…if you need anything please let us know. 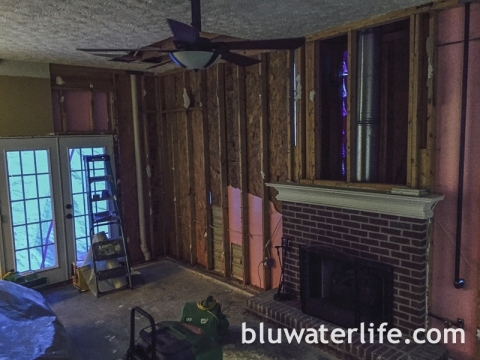 Caught a quick update yesterday from Bluwaterguy – WOW! Thinking of you guys!